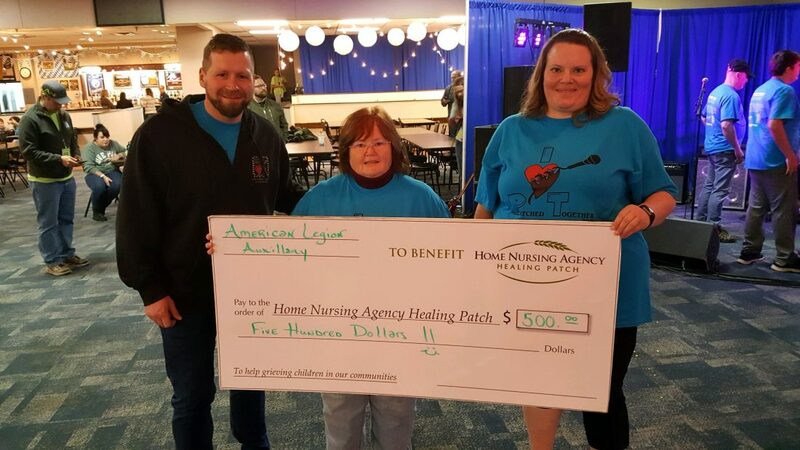 Courtesy photo The Loretto Legion Auxiliary Unit 748 presented the Home Nursing Agency with a donation of $500 to use toward the Healing Patch Program. The donation was presented at the Patched Together fundraiser held Nov. 17 at the Bavarian Hall in Altoona. Present in the photo are from left: Kent Tonkin of the Healing Patch, Donna Weiland of the Loretto Auxiliary and Gabrielle Cronin, chairperson of the Healing Patch. FLINTON — Glendale Elementary School will hold kindergarten registration for the 2019-20 school year on April 4 and 5. Students must be 5 years old by Sept. 1. To schedule an appointment, call the school at 687-4263. ROARING SPRING — As a staple in the Roaring Spring Borough, the Roaring Spring Community Library has always been open to the community for six decades. n Take a Coat, Leave a Coat, which benefits local citizens in need of warm attire with no questions asked. n And A Novel Affair, a dinner and silent auction to raise the necessary funds needed for our services and programs. Located at the historic Eldon Inn, the library primarily operates on donations given by the community to remain open. In the average calendar year, it costs about $100,000 minimum for the library to remain in operation. The library receives some local and state government funds but it only covers 46 percent of our operating costs. This year the library is asking patrons to consider contributing a tax-deductible donation of any amount to help keep the library open. For more information contact library director Michelle McIntyre at 224-2994. DUNCANSVILLE — The Duncansville Veterans of Foreign War Post 8724 Auxiliary sponsors a monthly Central PA Food Bank at the Duncansville VFW Post 8724, 1665 Newry Lane. The next give-away will be held on Feb. 11. It is for Blair County veterans, widows and active duty service members. Additional dates are March 11, April 8, May 13, June 10, July 8, August 12, Sept. 9, Oct. 14, Nov. 11 and Dec. 9. Proof of eligibility is needed — Military ID or DD-214. The Altoona District Bowling Association will be hosting an Adult Doubles — 9 Pin No Tap tournament at 2 p.m. Saturday at the Bavarian Hall. The cost of this tournament is $30 per double team — $15 per bowler. This tournament is open to all adult sanctioned bowlers. Team combinations can consist of two men, two women or one man and one woman. Early registration is welcomed but not required. Walk-in registration begins at 1:30 p.m. If you have any questions please contact, Terri Turiano at 931-6861 or private message Facebook @ Altoona District USBC.